A total health evaluation and fitness program designed specifically for firefighters. Promote good health and safe practices in your fire department with the simple fitness program outlined in THE FIREFIGHTER'S FITNESS HANDBOOK. 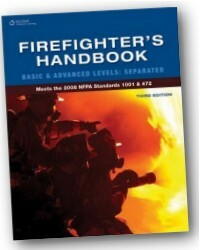 Beneficial to the both the individual firefighter, as well as the entire department, this book provides a total health evaluation and fitness program designed specifically for firefighters. This book focuses on the special needs of the firefighter and is Built around the joint labor management Wellness-Fitness Initiative (WFI) and compatible with both the NFPA standard 1583, and the 16 Firefighter Life Safety Initiatives. 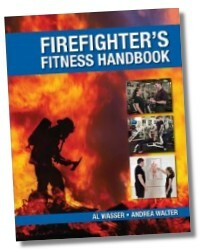 The book begins by covering the stress levels and physical risks inherent to the job itself, then identifies the principles of successful fitness program design to help firefighters evaluate their own health and fitness levels and program goals. Develop a wellness culture within your department to promote health and safety among firefighters and minimize injury and death on the fireground. Determine health status and starting points for exercises with health evaluation and biometric screening guides. Find information on selection and purchase of fitness equipment for the specific needs of your fire department. Record and track progress with health and fitness tracking charts. 1. Health and Fitness of Firefighters. 2. The Four Success Principles. 5. Developing A Wellness Culture. Appendix 1: Weight Training Exercises. Appendix 2: Screening and Performance Charts. 160 Pages - 8-1/2 x 11 in. Al Wasser received his M.S. degree from Colorado State University. He is certified as a Strength an Conditioning Specialist and as an American Council on Exercise Gold Certified Personal Trainer. A member of the National Strength & Conditioning Association, Al Wasser is also a Fitness Coordinator for Red Rocks Community College. Andrea Walter is a firefighter/technician with the Metropolitan Washington Airports Authority and a life member and former officer of the Sterling Volunteer Rescue Squad. She has been active in the fire and emergency services community for over twenty years and has served as the Manager of the Commission on Fire Accreditation International for the International Association of Fire Chiefs, and assisted in a variety of projects with the National Volunteer Fire Council, Women in the Fire Service, and the United States Fire Administration.